The Pagan Files: "Bring Back the Greeks!" Interview with Professor Bruce S. Thornton of the University of California at Fresno. Professor Thornton gave this interview to Davlos correspondent, Nancy Biska. Multiculturalism and Postmodernism: two parts of a "childish [intellectual] fashion." Q. Would you comment please upon the two trends currently influencing American Academia today, that is, "Postmodernism" and "Multiculturalism." A. Postmodernism is a childish and puerile construct, whose intellectual fallacies and inconsistencies are easily discernable. In its essence, postmodernism denies the existence of immutable truths, having to do with cognition, reality, etc., but paradoxically asserts that its own ideology is replete with knowledge and truth. It reminds me of that famous ancient saying that went: "All Cretans are liars," and this was said by a Cretan! Postmodernism is nothing new. Its ancestors were the radical and reactionary Sophists of the second half of the 5th century B.C. Multiculturalism is the ideological heir of the romantic nationalism which was so prominent in the 19th century, and whose monstrous descendant includes modern-day fascism. The idea that human beings are to be defined and acquire worth based on the chance happenstance of their birth into an ethnic category -- which is ostensibly possessed of mysterious and unique attributes -- is totally irreconcilable with the ideals of a free and democratic society. Multiculturalism, therefore, by its nature, enhances and increases the "politics of identity," the effort to insure preferences, rights, etc., for whole categories of people. Ultimately these categories, in the U.S., have come to rely upon their former unjust "persecution" as an instrument of power. They deserve to be officially validated, they say, as victims of persecution and exclusion. As a result, multiculturalism actually legitimizes categories as being inferior, by virtue of their being victims incapable of standing up to their victimizers. The intellectual capabilities of most American intellectuals is "pitifully inadequate." Q. Why, in your opinion, were these trends created and adopted by so many "distinguished" scholars, and how did the American academic community come to accept such obviously false ideas into their universities and colleges? A. 1) American scholars, and more specifically those found mostly in the humanities departments of U.S. universities, are woefully inadequate intellectually, thereby making them vulnerable to the fashions and foibles of the age. Additionally, the hiring, promotions, obtaining of grants and subsidies, are dependent upon how much the scholar in question has managed to publish; this holds true even if he's had nothing new or important to say. Plus, the theories of postmodernism and posts-structuralism provide unintelligible phraseology and a plethora of sugar-coated but essentially meaningless syntax that allows for the self-delusion of innovation and ground-breaking scholarship. 2) Postmodernism, and its disparagement of the principle of self-reliance, which has had such a corrosive effect upon western intellectuals for the greater part of this century, thereby causing the greater majority to lose confidence in their own capabilities and ideals, has also played its part by undermining the principles of rationality and democratic tolerance. The fact that these individuals are enjoying the fruits and benefits of these principles, both intellectually and materially, puts the onus of hypocrisy upon their intellectual inadequacies. 3) Multiculturalism, I believe, constitutes the results of the validation of a method of scholarship, whereby the creative abilities are marshaled to further the "politics of identity," rather than the accumulation of knowledge and the pre-eminence of scholarly discipline. The charge of "the white man's guilt" is helpful to this process. These academics, guilt-ridden because of the advantages they enjoy, in order to feel better about themselves, endorse the concept of diversity with which they, while not practicing it in their own personal lives, are forced to live with every day. How the East slanders the West. Q. 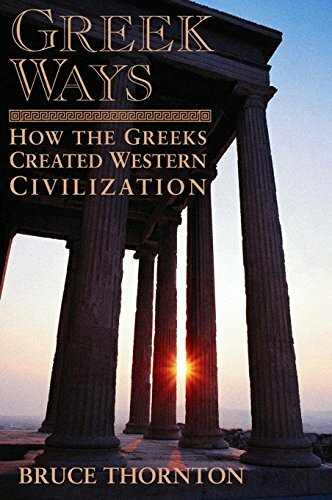 Why are the contributions to Western Civilization by the ancient Greeks being played down and even denied by so many contemporary academics? A. Multiculturalism is founded upon the principle that teaches that the West is dysfunctional, and is inherently criminal; and since the Greeks constituted the main inspiration and source of Western Civilization, it therefore follows that they are responsible and guilty of the same crimes. It is senseless and superfluous to comment further on such an unhistorical and pernicious falsehood. Hellenism is the only solution to the dilemma confronting the world. Q. Do you believe that the ideals of Hellenism remain viable today, and if yes, how might they contribute to contemporary society? A. Hellenic ideals, let's see: Individual freedom, representative government, rationalism and the right to define oneself and live according to one's conscience, are not only "viable," they are the very concepts which have triumphed to such a degree as to preclude any other alternatives. Even oppressive religious cultures such as Islam depend upon the science of the West to keep ideas like individual freedom from gaining a foothold among their adherents. That is why these ideals, and the sources from which they spring (Hellenism), must be taught, studied, and respected. Individual freedom or Theocracy and folklore? Q. Where is globalization leading us? How do you envision this phenomenon? A. An optimist might endorse the idea that globalism will lead to the diffusion of these Western values to every individual on the planet, which would mean material progress and individual freedom for all. On the other hand, a pessimist might believe that the price that we must pay for all of these benefits will be enormous: the marginalization of religion, the loss of traditional cultures, etc. We must also keep in mind that even now studies are being conducted to see whether the environment can support such massive development, and also, whether such development is even feasible in the third world. It seems to come down to the fact that we are being confronted with some very hard choices indeed: Do we continue to enjoy the comforts our economic advantages bring; good health, nutrition, freedoms, etc., knowing that the price we must pay is the loss of our traditional cultures? Or do we continue living with our old ways, and have to endure hunger, political oppression, etc. Argument can be made on both sides of this issue, but the vast numbers who migrate out of the third world in order to come to the West, would seem to prove that most people will choose economic security and individual freedom even at the cost of losing their cultural heritage. We here in America have been living with the dilemma of having to make that choice for many years. The Socratic Ideal and "let the chips fall where they may." Q. Many of your colleagues would call you a "conservative." A. American academics have been using the term "conservative" as a stigma, so as to avoid having to substantiate their positions with logical and fact-based argument. I am conservative in some of my beliefs and liberal in others. I believe in the Socratic Ideal, which I will paraphrase thusly: "I question everything, I seek the truth, and I let the political chips fall where they may." American mass media aggravates the situation. Q. Why is it that, in spite of the availability of and access to knowledge and information on a scale unprecedented in history, most people seem more and more inclined toward giving credibility to specious and wrong-headed ideas and positions? A. The American Educational System is so bad, that we've developed a population that is for the most part incapable of telling the difference between what is blatantly false and what is true. American mass media aggravates this problem by projecting a steady stream of deceptive but pleasant imagery, and continuously bombards our society with such deceptions designed to appeal only to the emotions. Q. Is this projection of pleasant and emotional imagery, based as it is on distortions and untruths, dangerous? Especially since we are now going through a very critical period of history. If yes, why? Q. What, then, would you say is the therapeutic antidote to the spiritual toxins of our age? A. Bring back the Greeks! Study their dazzling literature, because they were the ones who developed the critical thinking with which they defined the principle problems of humanity; the very same problems we are confronting today. Q. Do you believe that the U.S. can continue as the dominant nation on the planet in the light of this all-encompassing tolerance she's shown in the fields of education, culture, and the mass media? A. So long as the physical sciences resist these movements, the essential work in the military, economic, and research spheres will go on: this will ensure the continuance of American dominance. However, I'm more concerned with the degeneracy of values and character that has afflicted us. Should we ever have to confront a real crisis, and the American armed forces were called upon to engage in a war which resulted in large numbers of casualties for America, I really don't know what the reaction would be. I'm really not sure of what would transpire were Americans called upon to suffer the kinds of casualties that occurred in the Second World War, for instance. Both Americans and Europeans have become "soft" as a result of the material abundance they've enjoyed in recent years: this has given rise to higher expectations as to what constitutes human happiness. We've forgotten the tragic wisdom of the ancient Greeks, who knew that human aspirations and expectations were subject to the whims of fate. They taught that hardship and disappointment were the means by which we could grow in character and become better human beings. We must guard against dogmatism and theocratic tyranny. Q. At this vitally important juncture for the world and for humanity, which path should America choose: that of freedom of thought, of speech, of rationality, or that of the mysticism of theocratic tyranny and dogmatism? A. There is but one answer: our civil society must be distrustful [of authority] and ever vigilant [against the usurpation of our freedoms by government]. Euripides, in his Bacchae, demonstrates for us the dangers inherent in mysticism, as does Thucydides, in his account of the civil war in Corcyra [Kerkyra]. And we, especially, must guard against every form of mysticism, theocratic tyranny, and dogmatism, because these invariably restrict freedom of thought, of conscience, and [the freedom to acquire] knowledge. These values have, in the past, been systematically sacrificed on the altar of utopian dogmatism.